This week at the Global Design Project challenge blog we are CASEing this beautiful card by Louise Sharp. For my project I decided to go with a tag instead of a traditional card. I added the tag to a store-bought heart candy box covered with Painted with Love DSP (#145580). This is an easy way to get an great customized look. The tag is stamped with Calypso Coral ink using the heart from the Sure Do Love You (#145766) stamp set. Next, I stamped the sentiment directly over the heart with VersaMark ink and heat set it with gold embossing powder. I also dragged the bottom of the tag across the VersaMark pad and added gold heat embossing across the bottom edge as well. I wish I could tell you that it was easy to add the Gold Glitter Flakes (#146816), but it required a bit of patience. I used a toothpick to dab glue on the tag and then added the glitter piece by piece. Yes, it did take some additional time, but the end result was a very contemporary look and so much fun! I tied the tag onto the box using some Gold Love Mini Tinsel Trim (145588). 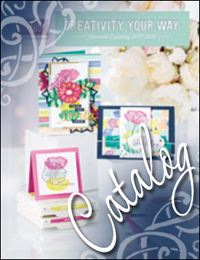 Welcome to a very special 2015-16 Stampin' Up! Artisan Design Team blog hop. Get the Limited time Thoughtful Branches bundle before its gone. If you earned in any coupons during the July Bonus days promotion, the Thoughtful Branches is a great choice to use it on. We did a sneak peak blog hop last month using this awesome stamp set and coordinating thinlits dies and today we have another round of fresh and exciting projects to share. Each team member has created at least two projects, but I just happen to have three. I love the versatility of this set and I wanted to do something completely different. You have probably heard me say before, "if I can make a flower with it, I probably will". That is exactly what I did for all three of my samples on this hop. For this ornament I stamped fifteen Real Red leaves on Real Red cardstock for the flower and a few extra Old Olive leaves on Old Olive cardstock for the leaves. I used hot glue to assemble the different layers of the flower and then offset each layer. Then I added small pearls to the center. I created a barn star with the largest die from the Stars Framelits. I die cut a slightly smaller star from This Christmas Specialty DSP and added it to the front. Then I added the poinsettia on top of that with hot glue. Of course, I couldn't stop with a poinsettia. I had to see if I could make my favorite flower...a sunflower. Here I stamped Crushed Curry ink on Crushed Curry cardstock for the flower petals. This time I stamped and die cut the hydrangea in Early Espresso and then I punched it out with a 1-3/4" circle punch. I punched an additional circle and mounted the die cut on top with rolled-up mini glue dots strategically placed so they aren't visible from the front. I die cut the flower stem from Old Olive cardstock. Next, I stamped leaves on the front of a Petite Cafe Gift Bag in Crumb Cake ink. I adhered the flower and a die cut sentiment to the front of the bag and added a removal Gold Binder Clip to the top with a fun linen thread bow. For my final project I created an elegant gold and silver tag that is perfect for holiday gift-giving. I die cut some Irresistibly Floral Specialty DSP with the largest die from the Banners Framelits. I also glued it to a second tag made of Thick Whisper White cardstock to give some stability. To make it look more like a tag, I hand cut the top two corners. I sponged on a little bit of Smoky Slate ink to bring out the embossed details. I stamped and heat embossed the leaves for the flower with gold embossing powder and die cut the petals with the matching die. I also die cut silver and gold metallic and glimmer papers to create some gorgeous leaves. The white on the the tag is different from regular Whisper White cardstock, so I cut the circle for the sentiment from the back of a scrap piece of the DSP that I used to make the tag. I put a list of the supplies for all three project at the very bottom of this post, so be sure to check there to see what you need to make your own beautiful projects. If you are already going through the hop, you should have just arrived here from visiting my amazing friend, Cindy Schuster. Next on our hop is the very talented Jennifer Frost, so be sure to head on over and check out what she and the the rest of the Artisan Design Team team have in store by clicking on the button below. You will be amazed at all the fabulous projects created by the Artisan Design Team so be sure to go all the way through the blog hop! Welcome back to another 2015-16 Stampin' Up! Artisan Design Team blog hop. This week we are featuring projects created with the Peace This Christmas stamp set and This Christmas Specialty Designer Series Paper. I have to admit that Christmas in July has always been a bit of a strange concept to me. Perhaps it is because the temperature outside is usually in the high 90's (F) and I typically spend most of the month picking blackberries and making blackberry jam. I know that there are plenty of places around the globe where warm temperatures are typical during December, but for me, it just doesn't "feel" like Christmas unless it is cold outside. Needless to say, it was a little difficult to get into the Christmas spirit this time of year, so I turned down the air conditioner and put on a sweater to get into the mood...too funny! I decided to make these fun gift card envelopes. The This Christmas Specialty DSP is a little thinner than our typical DSP, (but you get more sheets of each design), so it is perfect for this project. I also stamped and heat embossed these adorable tags by combining the "This Christmas" and the "Oh, What Fun" stamp sets. I didn't have a tag die in the size I needed, so I cut my own. They are approximately 2-3/8" wide by 4-1/4" tall. It was a little tricky combining the two sets because one is red rubber and the other is photopolymer, but it worked out fine. I stamped and embossed the sentiment first, then I stamped and embossed everything else. If you are already going through the hop, you should have just arrived here from visiting my awesome friend, Cindy Schuster. When you leave here you will travel on to visit the very talented Inge Groot. You will be amazed at all the fabulous projects created by the Artisan Design Team so be sure to "jingle all the way" through the blog hop...and have a Very Merry Christmas in July!